Okay, so I've spoken about ombre over here on my blog before, and I am well and truly in love with it. I have done ombre nails before, with bright green summery colours, but as Fall is drawing closer, I thought I'd do it again with darker colours (my favourite!). 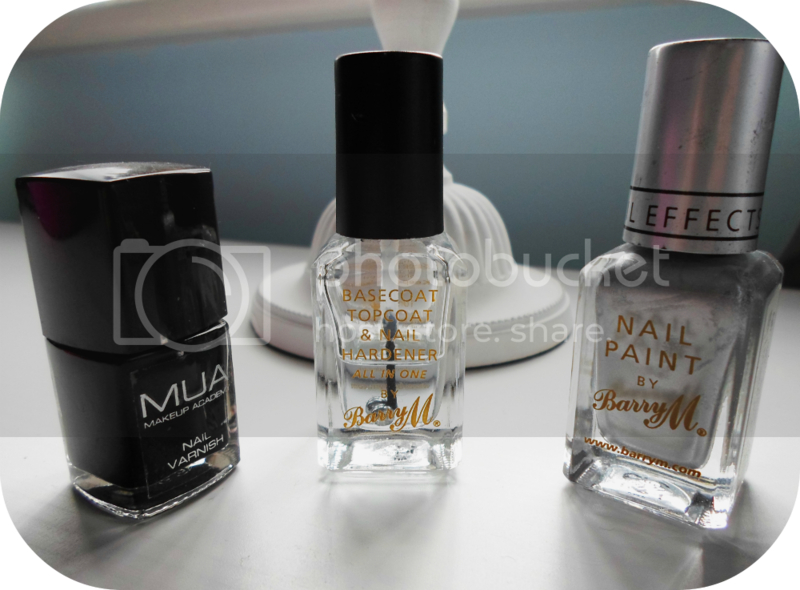 I used Barry M Basecoat & Topcoat, Barry M Silver Nail Effect and Makeup Academy Black polish. I mean, who doesn't like black and silver paired together? You want to start with the lightest colour underneath to get the best effect; but don't forget to put a basecoat on first! 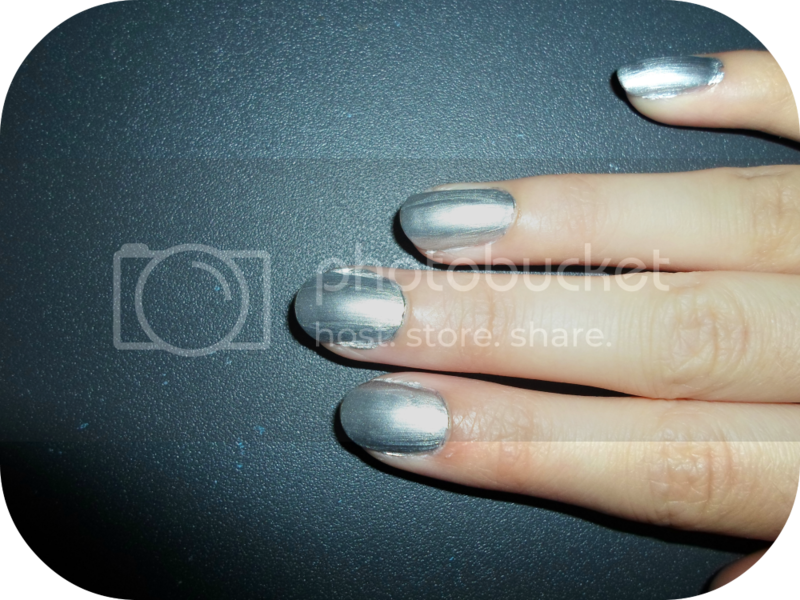 You'll then want to apply one or two layers, depending on coverage, of your chosen colour, in my case, the Barry M silver. Before you move on, you're going to want to make sure this layer is BONE DRY, this is very important! I made this mistake the first time trying this out, and left my nails a little tacky when moving on to the next step and I got in a right state. Everything smudges and gets pulled off, so don't make the same mistake. Next you're going to want to get something, I used a plastic folder sleeve, to place your nail polish on. This is the important bit, brush a little bit of each polish onto the surface, directly next to each other. Then get a cocktail stick (or anything else for that matter) and blur together the definitive lines; This is what will help give that gradient ombre effect. Now it comes to the slightly tricky part, take an eyeshadow applicator (cheap to buy from any highstreet store) or you could use a sponge, and run it through the polish, making sure to get both colours. Then simply take your applicator, position it so the darker colour sits at the tip of your nail, and just dabbing it across your nails. By doing it this way, you really have control on how large the ombre effect will be and how dark the tip will be. This can take a little time to begin with, and it does take patience to get it perfect, so don't try it for the first time before a big night out! After you have the darker nail polish sponged across the tip of your nail, make sure it's blurred into the lighter shade, and then simply add a layer of topcoat, which will help to further blend it out. Do this for all of the nails, and you're done! It really is simple once you know what you're doing, it just takes a little practice (and a steady hand) to get the colours blurred together perfectly. But once you get the hang of it, you can try a bunch of different colours variations and create some gorgeous looking nails! If anyone decides to try this, I'd love if you would tweet me pictures @NovaAlexxander, so that I can see what colours you all choose to use!